Some migrants were weeping as they met with Pope Francis during an emotional visit to the Moria detention center on the Greek island of Lesbos. One little boy ducked his head through a fence to kiss Francis’ ring. A group of unaccompanied minors has greeted Pope Francis and the leaders of the world’s Orthodox Christians and the Church of Greece as they arrived at the Moria migrant detention center on the Greek island of Lesbos. The teenage boys who have made the perilous journeys from their homelands to Greece alone were lined up at the entrance, shaking the religious leaders’ hands. Some of them were holding a Syrian flag. The three leaders then moved on to greet women and young children who stood behind a low metal barrier. The pope, patriarch and archbishop shook their hands and patted some of the children on the cheek, while some of the gathered refugees snapped pictures of the pontiff on mobile phones. The religious leaders’ visit to the island, which has seen the majority of the arrivals of migrants heading into Europe, is a highly symbolic one. It comes shortly after the European Union began deporting new arrivals back to Turkey under a controversial deal meant to stem the refugee flow. Dozens of refugees who won’t be among the lucky ones selected to meet Pope Francis on the Greek island Lesbos have gathered holding makeshift banners, hoping to catch a glimpse of the pontiff. Francis and the leaders of the world’s Orthodox Christians and the Church of Greece were heading Saturday to a refugee center on the island which has been converted into a detention center as part of a controversial European Union-Turkey deal. There they will meet with refugees and lunch with some of them. Those who were not part of the selected group gathered peacefully in the camp, holding aloft signs with slogans such as “Pope you are our hope,” ”please save Yazidi people,” ”we are also human,” and “Welcome Pope Francis”. Greek state television ERT reports Pope Francis has apparently offered to take 10 refugees back to Italy with him when he departs the Greek island of Lesbos after a historic visit. ERT says it appears eight Syrians and two Afghans will be offered passage Saturday. The inclusion of the latter would be a highly symbolic move at a time when Europe has stopped automatically considering Afghans to be refugees and doesn’t include them among the nationalities whose asylum applications are approved. Greek Prime Minister Alexis Tsipras says Pope Francis’ visit to the Greek island of Lesbos is a historic event and an important opportunity to highlight the need to find a legal route into Europe for those fleeing conflict. Tsipras says he is proud of the Greek people for welcoming refugees and other migrants at a time when they are suffering under austerity measures imposed on Greece by the country’s international lenders. “I am proud of this, particularly at a time when some of our partners — even in the name of Christian Europe — were erecting walls and fences to prevent defenseless people from seeking a better life. That is why I consider that your visit is historic and important,” Tsipras told Francis shortly after his arrival at the airport Saturday. 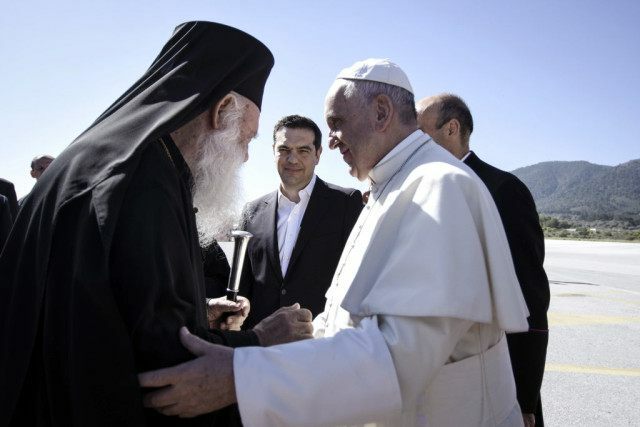 Pope Francis has been greeted on the Greek island of Lesbos by Greek Prime Minister Alexis Tsipras and the leaders of the world’s Orthodox Christians and the Church of Greece. Tsipras greeted Francis as he descended the stairs from the plane Saturday. He was followed by Ecumenical Patriarch Bartholomew I and the Archbishop of Athens and all Greece Ieronymos, who both greeted the pope with a kiss on each cheek before the Greek and Italian national anthems were played. The head of Lesbos’ tiny Catholic community was also present. Pope Francis has arrived in Greece for a provocative visit to meet with refugees at a detention center as the European Union implements a controversial plan to deport them back to Turkey. Francis’ Alitalia charter touched down at the airport in Mytilene shortly after 10 a.m., some 20 minutes ahead of time. Francis and the spiritual leader of the world’s Orthodox Christians will spend nearly an hour Saturday greeting some 250 refugees stuck on the Greek island of Lesbos. They will lunch with eight of them to hear their stories of fleeing war, conflict and poverty and their hopes for a better life in Europe. And then they will pray together, tossing a floral wreath into the sea in memory of those who didn’t make it. The visit is meant to highlight the plight of refugees, thank the Greek people who have welcomed them in, and to show a united Christian response to the humanitarian crisis unfolding. Greek Prime Minister Alexis Tsipras is meeting with the leaders of the Church of Greece and the world’s Orthodox Christians at the airport on the island of Lesbos shortly before the arrival of Pope Francis for a visit that will highlight the plight of refugees. Tsipras says Greece is currently hosting more than 50,000 refugees and migrants and is trying to provide them with good living conditions despite the difficulties. Most of those who have entered Greece from Turkey have done so through Lesbos, which has seen hundreds of thousands of people arrive on its shores in the past year. Francis and the two Orthodox leaders are to visit refugees and migrants being held in a detention center pending deportation and to throw floral wreaths into the sea in memory of those who died making the journey. Under a controversial European Union-Turkey deal meant to reduce the flow of refugees into Europe, those arriving on Greek islands after March 20 are returned to Turkey unless they successfully apply for asylum in Greece. Municipal crews are scrubbing walls in the capital and main port of the island of Lesbos after graffiti was sprayed overnight in places where Pope Francis will speak. The crews removed the words “Papa Don’t Preach” sprayed in black at several points on the seafront in Mytilene. Francis will visit refugees in Lesbos Saturday to highlight their plight. He will be joined by Ecumenical Patriarch Bartholomew I, spiritual leader of the world’s Orthodox Christians, and Archbishop of Athens and All Greece Ieronymos II, head of the Church of Greece. The joint trip comes shortly after the start of a controversial European Union-Turkey deal under which any migrant arriving on Greek islands after March 20 will be detained and returned to Turkey unless they successfully apply for asylum in Greece. The refugees were detained and brought to shore Saturday in the port of Mytilene. Later in the day, the pope, along with Ecumenical Patriarch Bartholomew I, spiritual leader of the world’s Orthodox Christians, and Archbishop of Athens and All Greece Ieronymos II, head of the Church of Greece, will toss floral wreaths into the sea nearby in memory of migrants who have died making the same journey. Under a controversial European Union-Turkey deal that came into effect March 20, all those arriving on Greek islands from that date on are detained and deported back to Turkey unless they successfully apply for asylum in Greece.